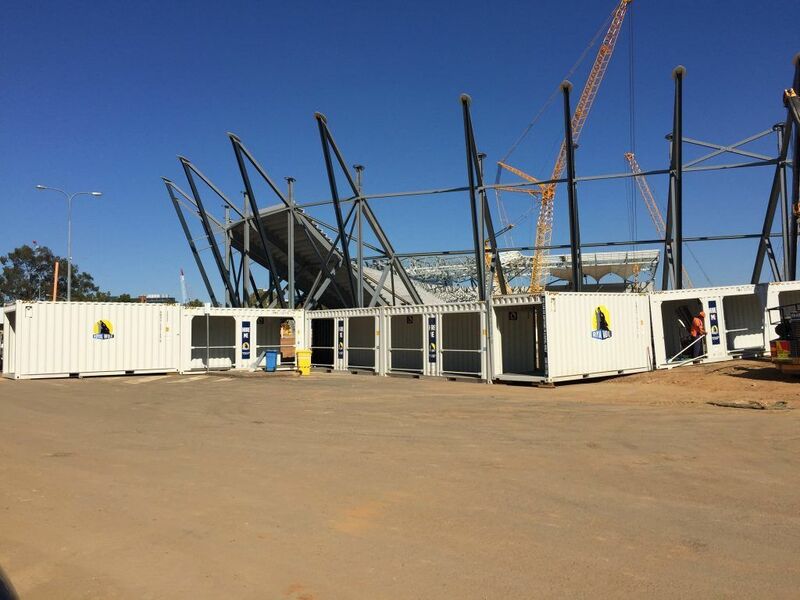 LendLease, the multi-national construction firm, recently tasked Royal Wolf to provide a protective work-site solution including hoardings for the $300 million Western Sydney Stadium – known locally as the Parramatta Stadium home of the Western Sydney Wanderers and Parramatta Eels. With multiple high cranes on site, workers moving from amenities to the building area needed overhead and weather protection. A strong, impact-resistant structure was needed to allow construction to continue. The new stadium is set to have a capacity of over 30,000 spectators and has a strict opening deadline of April 2019. Aware of the urgency, Royal Wolf designed and installed a 100-metre protective walkway within ten days of the initial request. This enabled LendLease to stay on schedule to build the new joint home of the Western Sydney Wanderers and Paramatta Eels. Thirteen 20-foot hoarding units, four 10-foot hoardings and two vehicle bridges were delivered and set up in one day with minimum disruption to the site. The 10kPa rated assets met the impact resistance requirements and arrived complete with floors, walls, overhead protection and lighting to guarantee an easy to install structure. Being large in scale, the construction site sees heavy vehicles frequently traveling in and out, meaning a break in the walkway was required to let them pass under. With no standard solution available, Royal Wolf improvised by combining two 20-foot bridges side by side to meet size demands. The result has provided access without compromising on safety. Lendlease plans to keep the walkway operational for twelve months in total, with the structure forming an integral part of the site. Royal Wolf's container hoardings are available for long or short-term hire and provide solid overhead protection on building and construction sites. They are the highest quality on the market with impressive resistance from vehicular impact, slip resistant flooring, unrivalled protection for users and an aesthetically pleasing design.